Each year, Paul Daffey and John Harms publish the best of the year’s contributions to their ‘Footy almanac’ website in a hefty paperback documenting the football season just passed. They invite an artist to produce an image of the season’s iconic player for the cover. 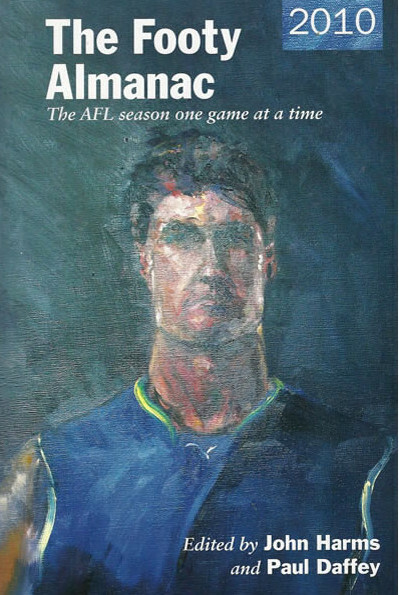 In 2010, John Harms asked me to write on Geoff Dyer’s cover portrait of Jonathan Brown, of the Brisbane Lions. He later described my contribution as ‘brave’. A little way into this year’s Brownlow Medal count, I had a vision of football’s future. Players stepped into the background as their wives and girlfriends plugged whoever had lent them a dress for the night. They enjoyed themselves responsibly under the watchful eyes of Australian Football League (AFL) minders. They stuck to the script, avoiding questions about trades, coaches and forthcoming finals. The oughties have delivered a new kind of football hero, one forged in a televisual melange of panel shows, cross-promotion and staged events rather than on the playing field. More than anything, winner Chris Judd’s acceptance speech heralded the change. Understated and strangely sheepish, it had neither the inarticulateness of a modest boy from the bush nor the courteous blandness of a champion sparing the feelings of the losers. Instead, it was the tightly disciplined speech of a player distancing himself from proceedings. In one of the most telling moments, Judd launched into the generic ‘childhood dreams’ section of the winner’s speech, humbly declaring that ‘I would never have imagined, when I was a kid kicking a footy in the drive way in …’ before stopping abruptly when he realised he was on the verge of identifying his childhood home. Determined to protect his privacy, Judd short-circuited the narrative of the hero’s journey in favour of a rather shame-faced evasiveness. The football hero, classically conceived, is an endangered species. Physical prowess, courage, determination and character are still part of the game but today’s heroes are shaped by narrow criteria and spoken of in a peculiarly constrained language. Heroism today is not about dreams or journeys, and certainly not personalities. Football has become hyper-secular. All the trappings of faith—saints and miracles, idols and worshippers—are being rigorously expunged from the rhetoric of football. It’s all weirdly reminiscent of the years immediately after the French Revolution, when the state attempted to replace Christianity with the cult of the Supreme Being. There’s no shortage of public ritual but worship is passionless and premeditated. An all-pervasive air of technocracy eats away at the believer’s faith. There’s no need to cue up Tina Turner; we still need heroes. In fact, we’re likely to see more of them than ever in the next few years. The AFL’s expansion franchises in Sydney and the Gold Coast will be marketing high-priced marquee players and spinning yarns about local boys made good. The established teams will promote journeymen to fill the gaps left by departing superstars. But what we’ll get is a different kind of hero. Greatness is no longer a pillar of fire or a dragon-slaying warrior. Greatness is now registered as a set of ‘achievements’—statistics, numerical career milestones, transfer payments and dream team points. When heroism registers as a ‘milestone’ rather than as a miracle, the fans are left with hollow ceremony and a lack-lustre liturgy. Historically, heroes have been integral to the formation of our national game. Writing in the Daily Telegraph in 1889, ‘A non-footballer’ saw how the game’s momentum emerged from the passions of heroes and fans alike: ‘In these days of ours, when men breathe an atmosphere charged with electricity, every lustrum produces a new race of heroes and of hero worshippers’. Hero worship was the pulse of colonial Australia, according the scribe: ‘The footballer being the hero, and the barracker being the hero-worshipper of the hour, it is, if we may accept the witness of Carlyle, it is to them we must look if we are to understand our age. For, according to the sage of Chelsea, knowing what men truly admire and how their admiration expresses itself, we know the men’. The authority to which the nineteenth-century journalist appealed was Thomas Carlyle, who declared in his book On heroes and hero worship and the heroic in history that ‘Society is founded on Hero-worship’. For Carlyle the history of the world was nothing ‘but the Biography of great men’. As a Big Picture kind of guy, Carlyle was never going to let an occasional display of human frailty stand between him and a hero: ‘I say great men are still admirable; I say there is, at bottom, nothing else admirable! No nobler feeling than this of admiration for one higher than himself dwells in the breast of man’. If Carlyle seems dated today, he still has two significant advantages over those of us entrenched in the technocratic milieu of twenty-first century football. He could articulate, with unembarrassed passion and at great length, what he thought the qualities of a hero were. And he could see a grand purpose in admiring heroes. We rarely encounter either of these today. What language have we left to speak of heroes? And what would a hero look like? For an answer to the latter question, we could turn to Geoff Dyer’s portrait of Jonathan Brown. In many ways, it militates against the anti-heroic tendency in contemporary football. In the painting, Jonathan Brown is more sombre, more purposeful, more monumental than he is in any post-match interview or panel show appearance. There’s no sense of formulaic sound bite, self-deprecating bonhomie and pie night aphorism. The painting is about the bedrock of a champion player: physical presence, psychological challenge and self-possession bordering on arrogance. As to the former question, I’d suggest that we first have to exorcise some of the habits that have come to dominate writing about football’s current champions. The list is foremost among these. ‘My top 100 players’, ‘Today’s best backline’, ‘Team of the century’; all of these plot and rank great players without saying what it is that makes them heroes. Ditto the human interest profile. It’s pointless to tell ourselves that the hero is just a good bloke, a guy like us. That’s not what heroes are about. Intriguing to hear the off-field reflections, to step into the mind of a champion. But not so useful when it all reads as so much back-story to a studiously avoided larger narrative (that would be the game of football). Likewise the myriad strategic analysts, all of whom prefer anodyne comments like ‘Jonathan Brown needs to stand up this week’ to ‘What Brown needs to do is take out a couple of guys, kick a bag, stick it right up ’em etc’. Carlyle had the language and wasn’t afraid to use it. He described the hero as ‘The Commander over Men; he to whose will our wills are to be subordinated’. You can’t say that sort of thing if you’re wedded to the managerial language of the ‘leadership group’ and the ‘playing group’. It’s not the sort of language that Jonathan Brown would use either, at least, not the verbal language. Body language is a different matter. And this is where Dyer speaks so well on Brown’s behalf. Above all, Dyer’s portrait gives Brown an air of formality; he’s not afraid to declare Brown’s sense of purpose and superiority. This is a face that channels Cromwell, one of Carlyle’s heroes, warning an enemy that failure to surrender will be answered with ‘the extremity usual in such cases’. This is the face that warns there will be blood. This is the face of a hero. Original publication: ‘Heroes’, John Harms and Paul Daffey (eds), The footy almanac, Penguin, Camberwell, 2010, pp x–xiii. 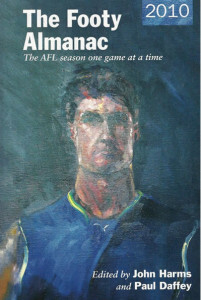 Visit the Footy Almanac website to buy a copy.